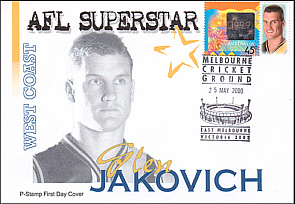 Glen Jakovich played his first game for the Eagles in 1991. He won the clubs Best and Fairest in 1993 (equal with Don Pyke), 1994, 1995 and 2000. 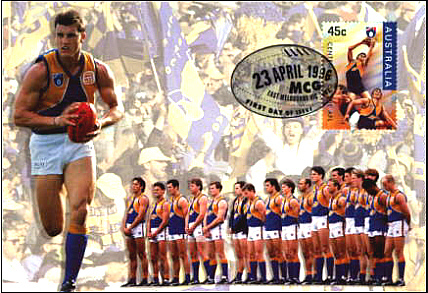 He was chosen as an All Australian in 1994 and 1995. He won premierships in 1992 and 1994. 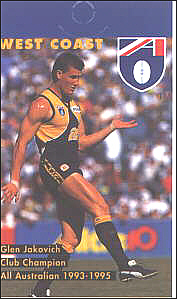 His 1996 season was severely hampered by a knee reconstruction in round 12 and if he had remained uninjured his career would have reached even greater heights. He has played 227* games mainly as a centre half back. 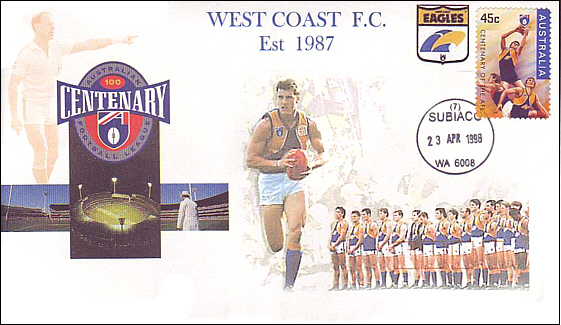 In recognition of his services he was chosen by the West Coast Eagles Football Club as its star on the inside cover of the stamp booklet (displayed above), West Coast Eagles Centenary Maximum Card and Postcard. The maximum card is displayed below. The postcard is essentially the same except that the background is brighter and there is no postmark. A cover with the outline of the postcard was also released. 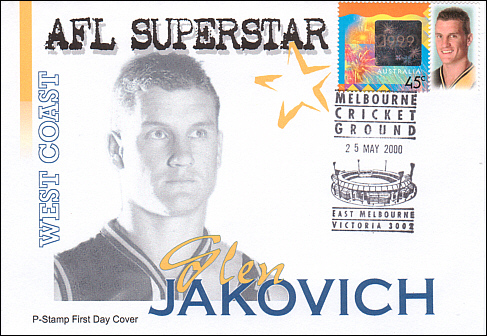 In 2000 he was included as one of the 27 covers to commemorate the "Superstars" of the AFL on the first day of issue of the AFL P stamps.